Homes with wood floors sell faster and earn a higher price, according to the National Wood Floor Association’s survey of real estate agents. Every homebuyer has his or her own reasons for choosing hardwood floors, but their durability and beauty are commonly admired. There are other reasons for the popularity of hardwood flooring – Portland to Poughkeepsie, the following traits come up time and time again. Basketball players and gymnasium owners appreciate these characteristics of hardwood floors. Portland homeowners also like the solid yet forgiving feel of wood floors. Hardwood floors are perfect for high traffic rooms, including the living room, dining room and bedrooms. 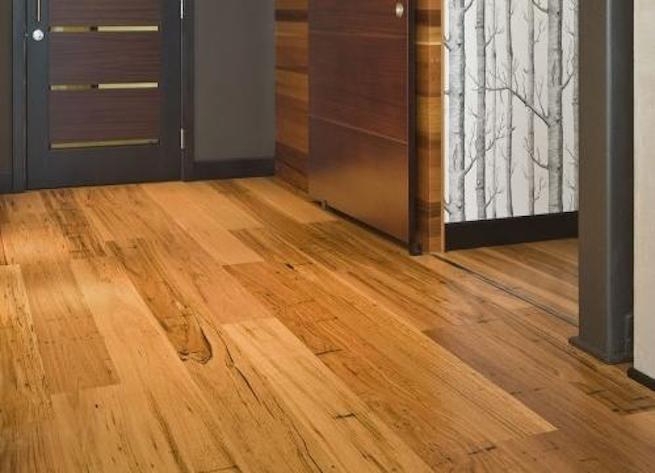 Today, thanks to the technology behind engineered hardwood flooring, Portland residents can even enjoy the warm look and feel of hardwood in their bathrooms and kitchens, as well. Have you noticed how many local performance spaces favor wood paneling and hardwood flooring? Portland’s popular Doug Fir venue even features full-size logs. Commercial designers have long cherished wood’s ability to absorb sound, and homeowners appreciate this trait as well. Designers and homeowners also delight in the wide range of colors and textures in today’s wood floors. With so much variety, it’s easy to compliment any décor. For evidence of this, consider just one catalog – that of Kentwood Floors, which includes traditional solid hardwoods in intriguing tones such as Maple Cannon Beach, a silvery brown. The Kentwood couture collection includes exclusive herringbone designs, while the elements grouping offers click-together construction. The bottom line is that nearly any budget and taste can be matched with today’s hardwood floors. Portland residents who have been trying to sell their homes for some time may find that hardwood flooring does the trick. Potential homebuyers can’t help but notice a home’s floors, and rich wood flooring will make any property much more appealing. Installing new hardwood floors is the perfect way to update an older home and speed along its sale. If you’re putting your home on the market, or if you’ve been trying to sell a property for some time, consider hardwood flooring.